In October 2006 the Advertising Research Company Ipsos-ASI prepared a special report on familiarity with the campaign “All of Poland Reads to Kids”. Ø In September 2006, 85% of Poles stated they were familiar with the campaign, which is 8% more than in September 2004 – a statistically significant difference. Ø As in 2004, women were more likely to have heard of the campaign. Compared to 2004, the number of both women and men who recognized the campaign grew significantly. Ø Familiarity with the campaign grew significantly among all age groups, except for the bracket above age 59, where the increase compared to 2004 was not statistically significant. The greatest growth occurred in the age groups 15-19 (12%) and 50-59 (18%). Ø Compared to 2004, familiarity with the campaign grew among all eduational levels except for those with a vocational-school education, where it remained at the same level. Ø Familiarity with the campaign rose among adult Poles living in rural areas as well as in cities with 50,000 or more inhabitants (18%). In the case of residents of other categories of locales, the level of familiarity in 2006 was similar to that in 2004. Ø The increase in familiarity with the campaign in September 2006 was observed in all regions except for Pomerania, where a decrease in familiarity was noted, and Wielkopolska, where the level of familiarity was unchanged. Ø The campaign was very well recognized by people who have children aged 10 or younger. The “All of Poland Reads to Kids” campaign is known chiefly from television, followed by radio and press (as in 2004). 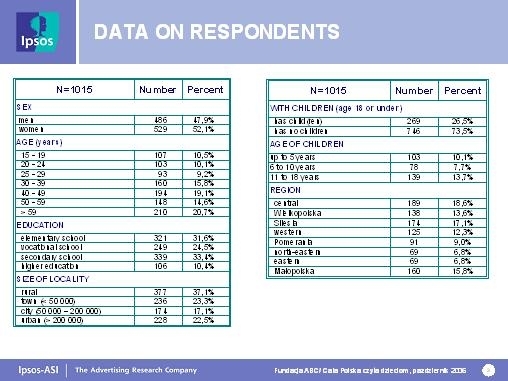 61% of adult Poles saw the television campaign for “All of Poland Reads to Kids,” while 32% saw the outdoor advertising campaign.